Details … Details. Lisa + Bruce get married in Julian at The Pine Hills Lodge. A bluebird day in Julian is about as beautiful as it gets! Lisa’s vision for her end-of-the-year wedding was “A Princess Lives Happily Ever After”. That’s exactly what she got, thanks to the fabulous Courtney Urquiza and her company Dream Events By Courtney (www.DreamEventsByCourtney.com). I’m not sure I’ve ever seen a team work harder and, at the end of the day, no detail was left undone. Let’s start with the accessories Lisa brought. 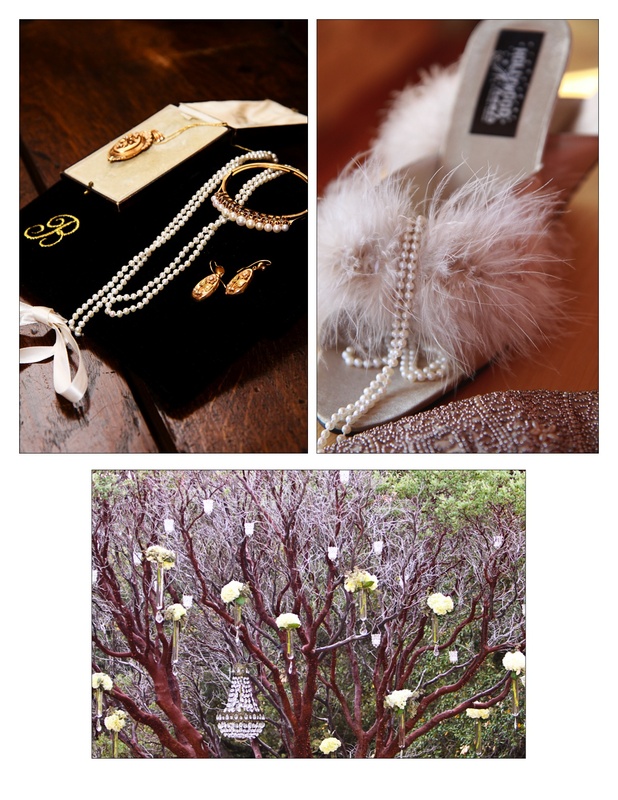 Beautiful vintage jewelry, and don’t you love those maribou slippers for her wedding night? The manzanita tree that provided the backdrop for the ceremony at The Pine Hills Lodge was decorated with hydrangea-filled vases, candles, and vintage chandeliers. Everything, and I mean EVERYTHING you see here was transported from Orange County to Julian. Since Julian is all about apples, cider was served as the guest arrived. Blankets were on hand in case the air got chilly, and rose petals were given out for the bride and groom’s exit. Yes, the vintage dressing table was brought from the OC. 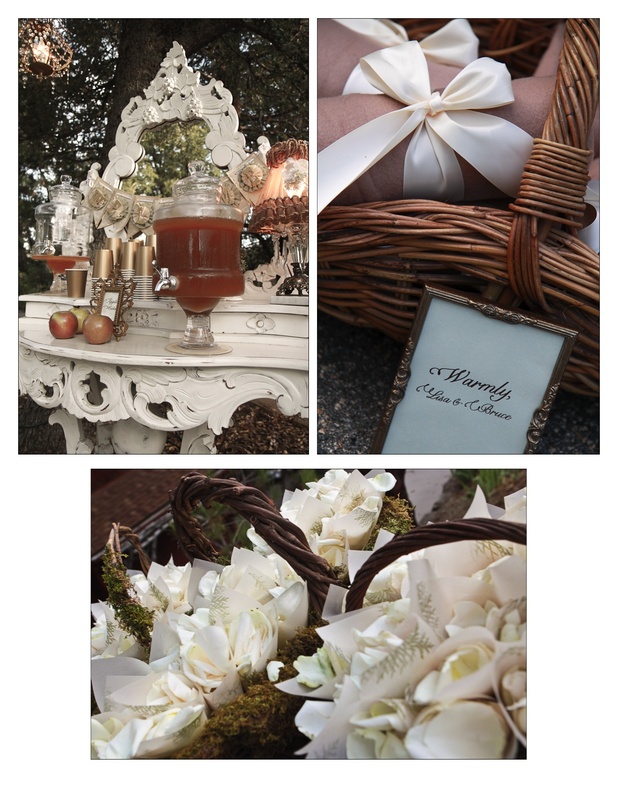 Other amazing details: The antique suitcase for gift cards, “sweetie pie” stand for apple pie (rather than wedding cake! 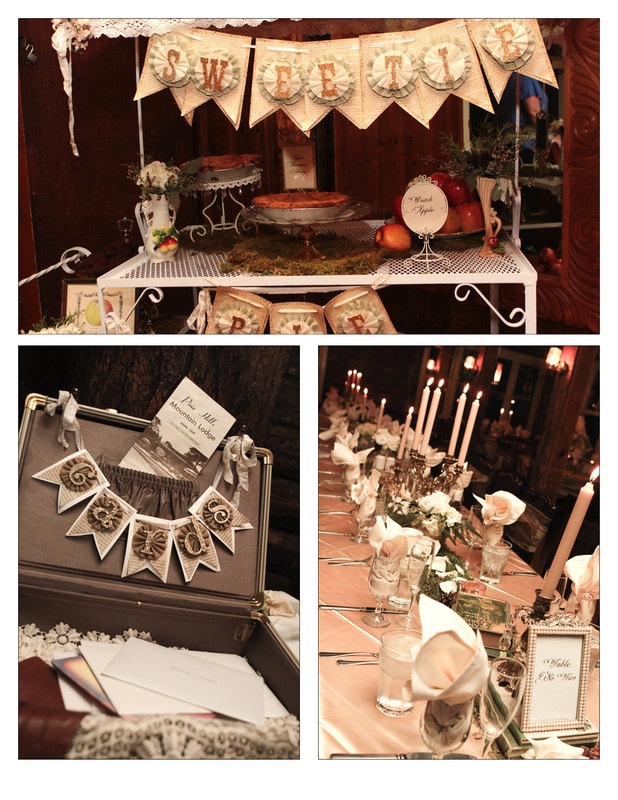 ), mossy runners down the center of the long dining tables, which were also adorned with vintage books. 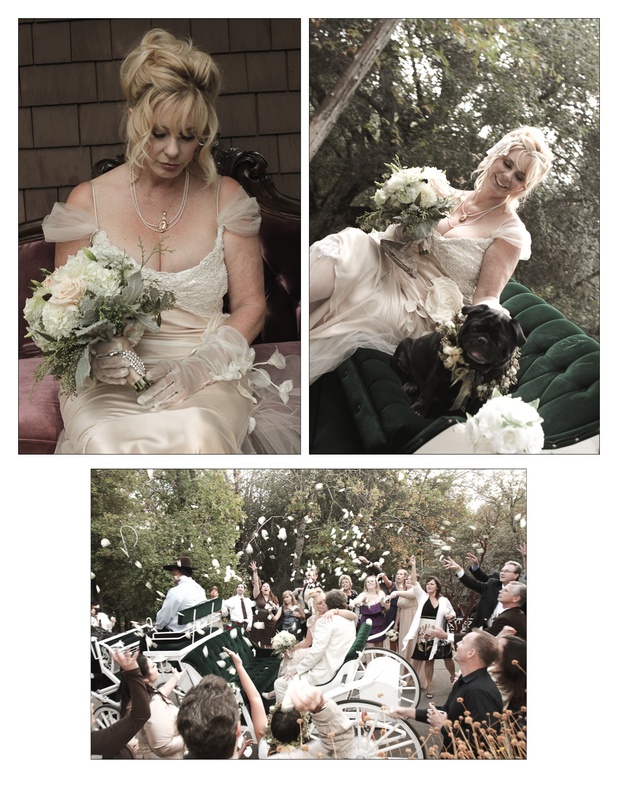 Our bride pre-ceremony on a rose colored Victorian settee (of course, brought from home), and her arrival in a horse-drawn carriage accompanied by Chauncey the pug. Although Lisa’s gown is new, it certainly had that vintage feel … as did her gloves and hair. Antique cake toppers were in abundance throughout the reception area… as well as vintage ladies’ handkerchiefs draped on the fireplace mantle, and a multitude of beautiful chandeliers. 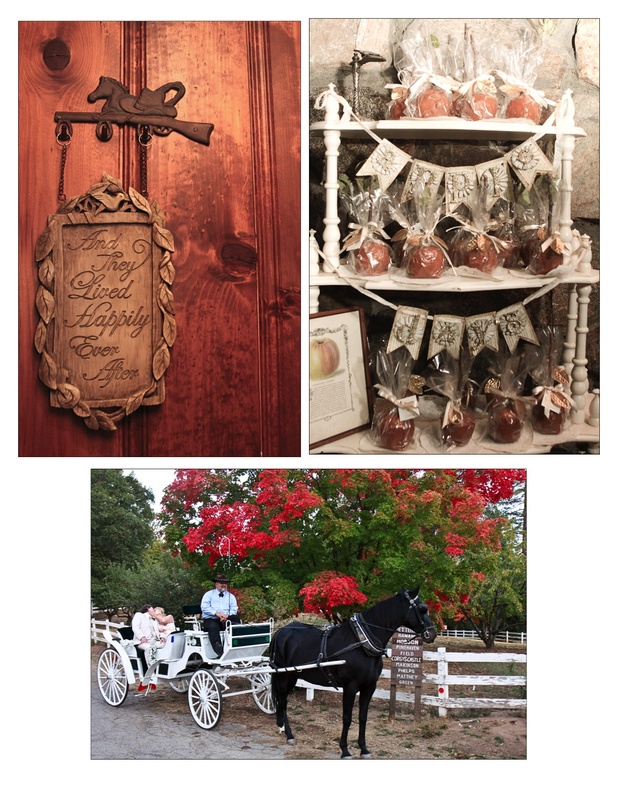 One final touch … guests were invited to take fresh caramel apples on their way out. I can only assume that our Princess and Prince will live happily ever after, as the sign (belonging to Lisa, of course!) indicates. This entry was posted in Uncategorized and tagged julian wedding, julian wedding photography, Pine Hills Lodge, Pine Hills Lodge wedding photos.